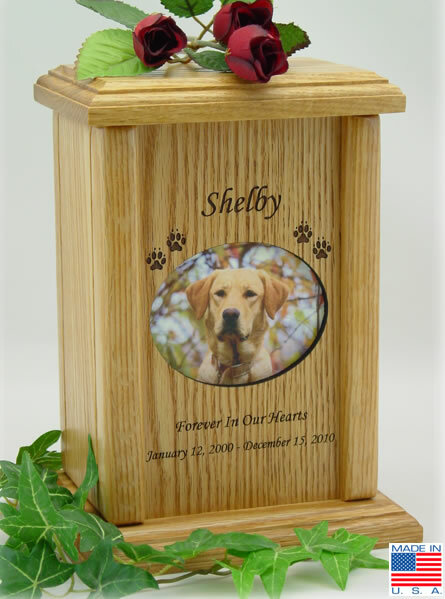 This beautiful Photo Pet Urn is crafted of solid Red Oak and Alder. The tone of this wood makes a nice background for photo of your beloved pet. 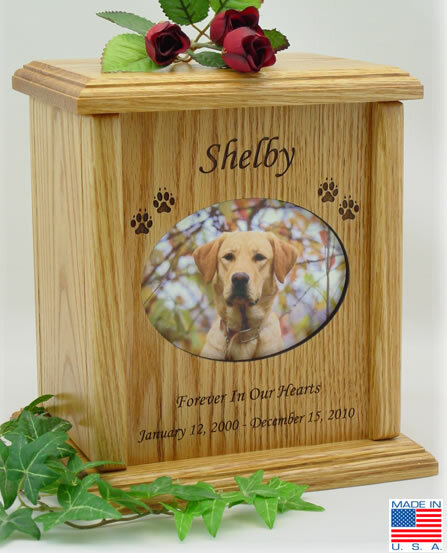 The name of your pet, optional paw prints, birth and passing dates, and a short sentiment can be engraved. Please limit engraving to no more than 25-30 spaces per line. The engraving is included in the price of the urn. The photo placement area is protected by a piece of glass and a wood frame which can slide open with ease for your photograph placement, without opening the bottom of the urn or the removal of the cremains. Brass screws attach the bottom plate to seal the urn. Pads are placed on the bottom of the urn to protect your furniture. Volume: 45 cubic inches - for most pets with healthy body weights up to *25 lbs. Volume: - 76 cubic inches - for most pets with healthy body weights up to *50 lbs. Volume: 106 cubic inches - for most pets with healthy body weights up to *75 lbs. Volume: 136 cubic inches - for most pets with healthy body weights up to *110 lbs. *Note: Industry standard in urn sizing is one (1) pound of healthy pet weight = 1.25 - 1.5 cubic inches of cremains. Please calculate weight when pet was healthy. Note: Bone density and cremation processes differ which may effect volume of cremains. This is a quality product created by skilled American craftsmen. Please allow approximately 3-4 business days to complete. Rush orders are a possibility but still require 2-3 days to complete before shipping.